Now, there is a photo of a dress floating around the internet right now. you may have seen it. Is the dress white and gold? Blue and black? Nobody seems to know. 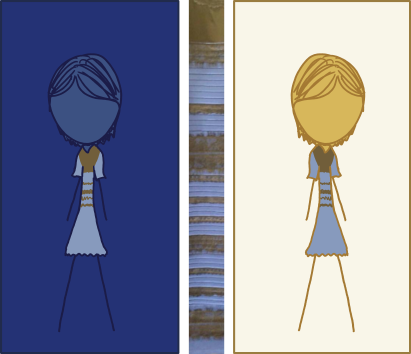 Personally, I saw white and gold first. That's entirely beside the point. What's really interesting is why nobody seems to agree. There have been a few explanations thrown out there. The most popular seems to be that it has to do with whether or not your eyes are good at seeing in the dark, whether your cones can pick up subtle differences in dim light. Since my computer monitor is an emissive surface, that explanation didn't make a lot of sense to me. Surely it can't have to do with dim light if I am looking at something that is glowing. 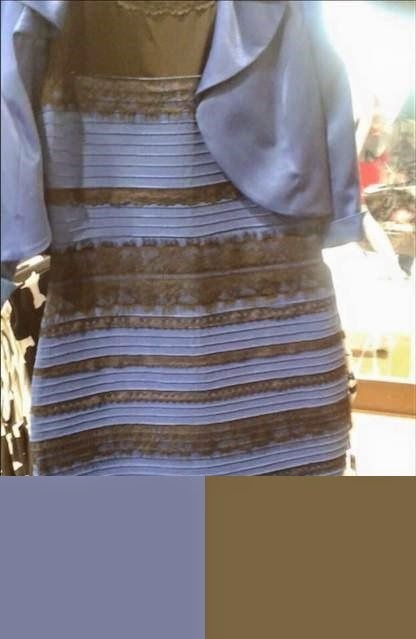 I looked at the picture again, and saw it instead as blue and black. How could it have switched? Then, it hit me. It's all just an optical illusion. Most of you will have seen the infamous drawing of a rabbit pictured above. Or is it a duck? (I tend towards seeing the rabbit.) You might only see it one way at first until someone points out to you that your brain has been duped by some trickery. 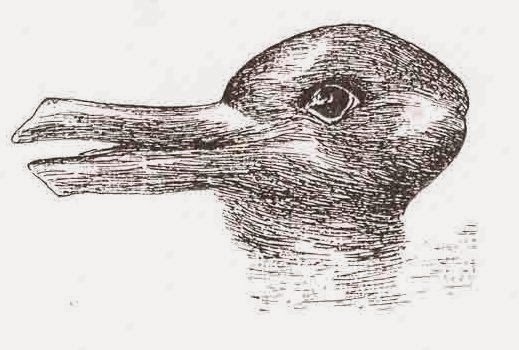 Optical illusions take advantage of assumptions and eccentricities of the brain. It's easy to see how this works with shapes, as is the case with our friend here, but how could it work with colour? Colour constancy is the phenomenon that allows us to recognize colour under different lighting conditions. Based on the surrounding scene and our assumptions about reflectance and luminance, we can tell what colour things are even when conditions change. For example, in the above picture, it's easy to see that square A is one of the dark grey squares in the light, and square B is one of the light grey squares in shadow. 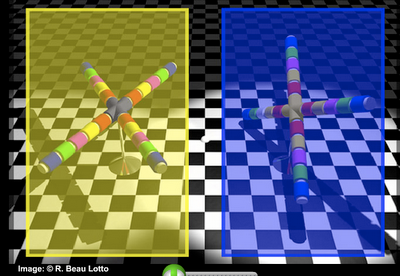 In actuality, A and B are the exact same shade. This phenomenon isn't limited to just shades either, but also colours. Your computer is displaying the exact same colour for the vertex of each X above, but, because of the apparent filters over the image, your brain is telling you that the left vertex is blue, and the right vertex is yellow. There is a similar example in this video. 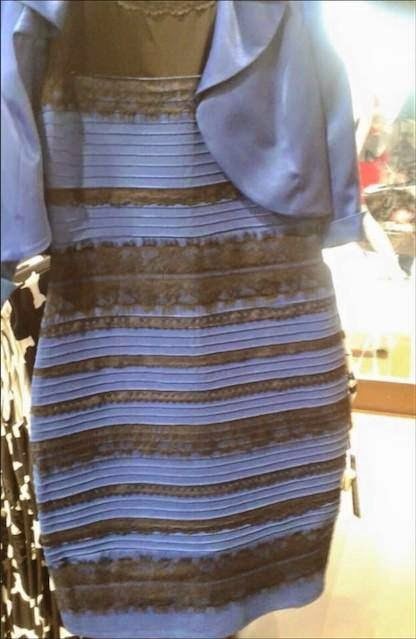 So, what does this mean for that dress everyone is talking about? Clearly, we can't trust exactly what is presented in the photo (though, for the record, it's Ship Cove Blue and Go Ben Yellow). My intuition is that the colour you see the dress as has to do with how you perceive the lighting in the photo and the assumptions that come with that. The quality of the picture is obviously not great, the right bit is overexposed. Is it just back-lit? Or is the whole photo overexposed? What sort of lighting is behind the camera? For me, an inexperienced photographer, the answers aren't really clear. What is clear to me is that the illusion of colour comes from what your instincts told you the answers were. Does all this talk of illusion make anyone else want to watch Doug Henning? Of course, Randall Munroe summarized this phenomenon eloquently and wordlessly this morning.